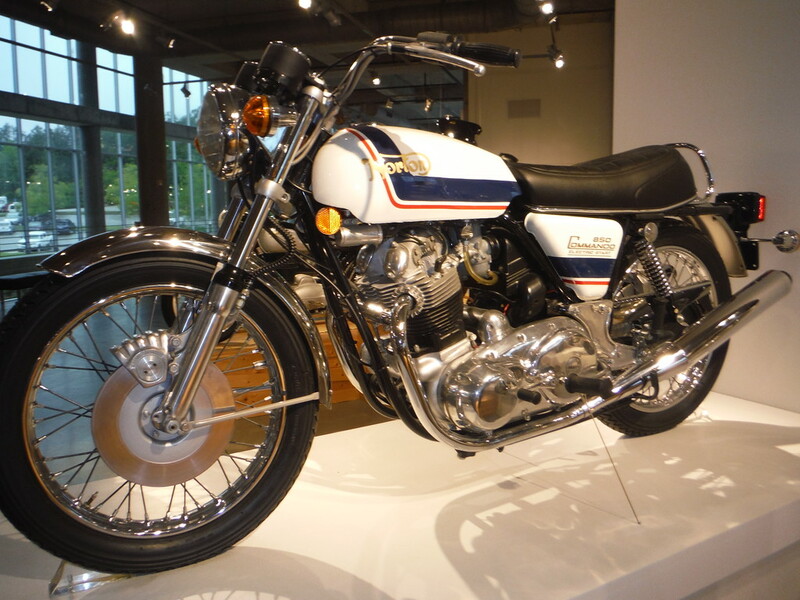 I always liked the look of them, and as far as I can remember only ever saw one on the road. Well the technical data page for a 850 and 750 workshop manual Copyright 73, has a Roadster with oil and 1 gallon of fuel (imp or us)? at 422 lbs. Maybe the Mk3 porked out at 93 lbs extra. castings, forgings, tubes, etc. ranging 5 %"
<----That weighs right at 400 lbs soaking wet. Used to be a bit under with alloy fenders, but I got tired of polishing 'em. Showed about 410 total on two 250-lb. bath scales and even less on a grain elevator scale. 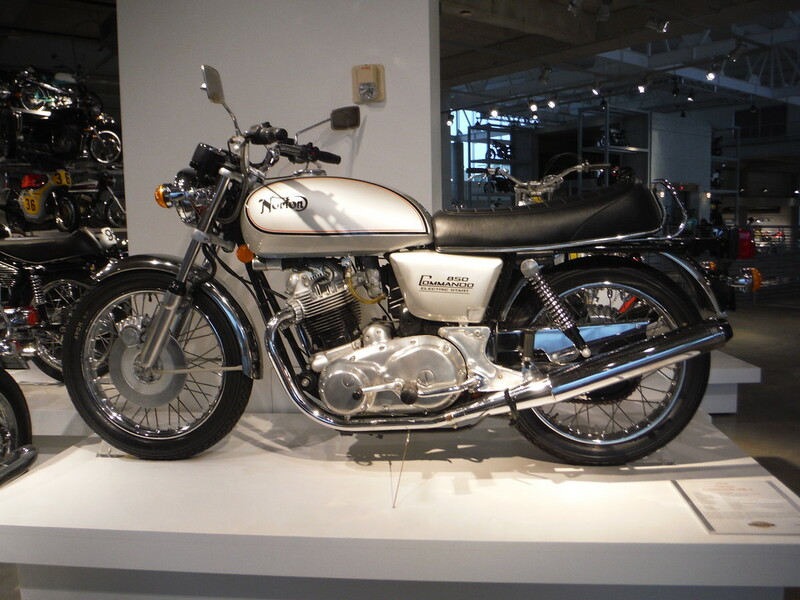 I am surprised that the carbs were still rigidly mounted. I would have thought by that time, they would have changed to flexible mounts. Perhaps they believed the motor did not shake ? I have it somewhere in the file for that bike. My MK3 Interstate weighs 448 lbs without fuel. That number would be 454 without alloy rims and Madass front brake, a six pound savings. Thanks, plus I guess you have some other savings, pea shooter instead of black caps for example? Possibly, I haven't any original black caps to weigh for comparison. Other than that the bike is stock. Some days I think about removing some weight, then I remember it's my most comfortable riding bike and refrain from doing so. I recall that Ludwig had some initial ride issues with his Superlight Commando. My 348 lb Egli with GSXR suspension is also quite harsh. 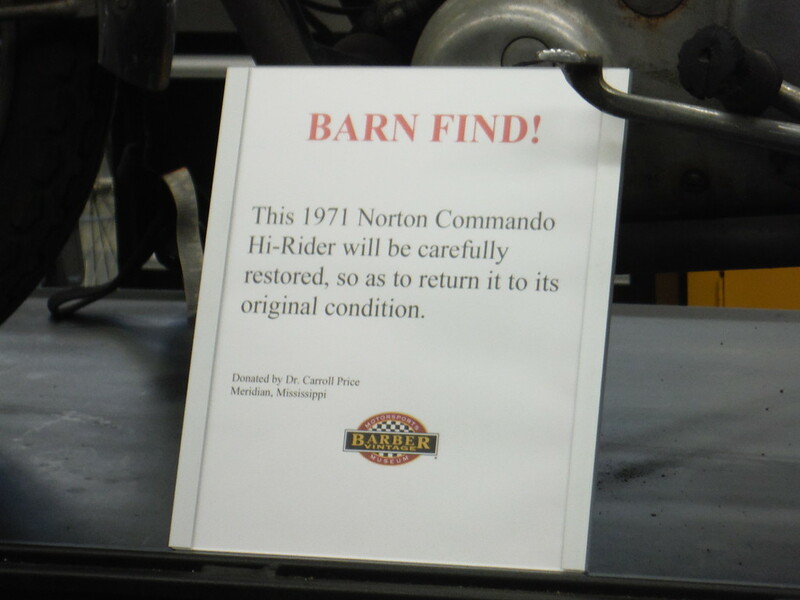 You would think with Brian Slark working at Barber, any info on a Norton Commando should be reliable. 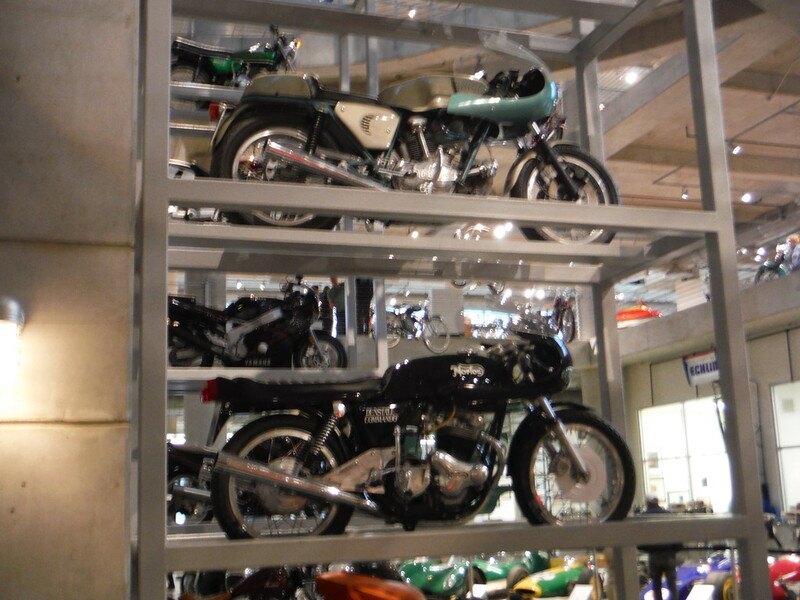 There is a 30's Norton single there, the placard states it's a Model 19, but the crankcase is clearly marked 79x100. I live about 20 minutes from Barber, I have been through there a bunch. I have one exactly like that. I have one exactly like that too . Also the Silver Interstate too. That makes too (2). My 850 on a $140,000 scale, Department of weights and measure approved. I put in a bit over 2 Imperial gallons of fuel, so fuel, oil and battery are 16kgs. Most manufacturers using dry weight do not include the battery. Some even remove the chain. That's how they get those numbers down! 215-16 = 199 kgs or 438 lbs dry weight. I think a 750 or pre MK3 850 with an added E start is going to weigh the same +- 5 lbs. So much for the lardy 120 pound overweight MK3 myth! 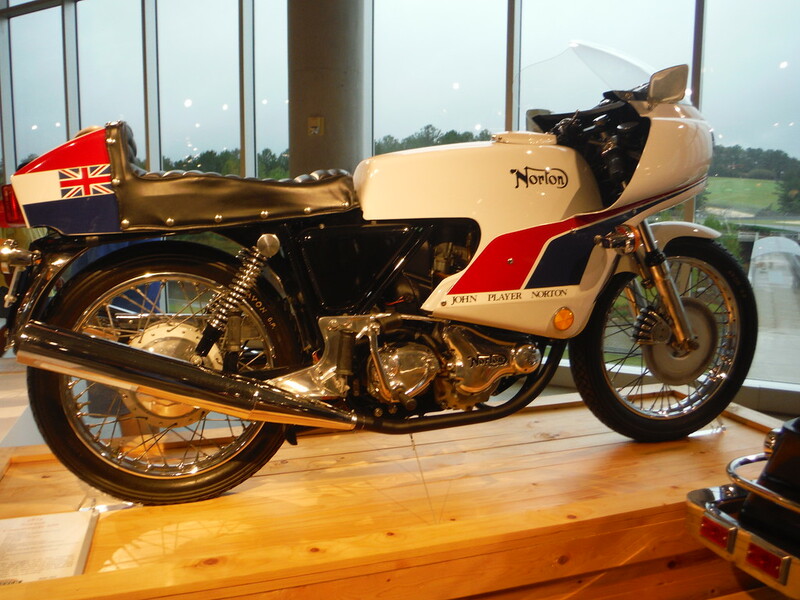 What a travesty, that bike would look smicko original with two weeks work. 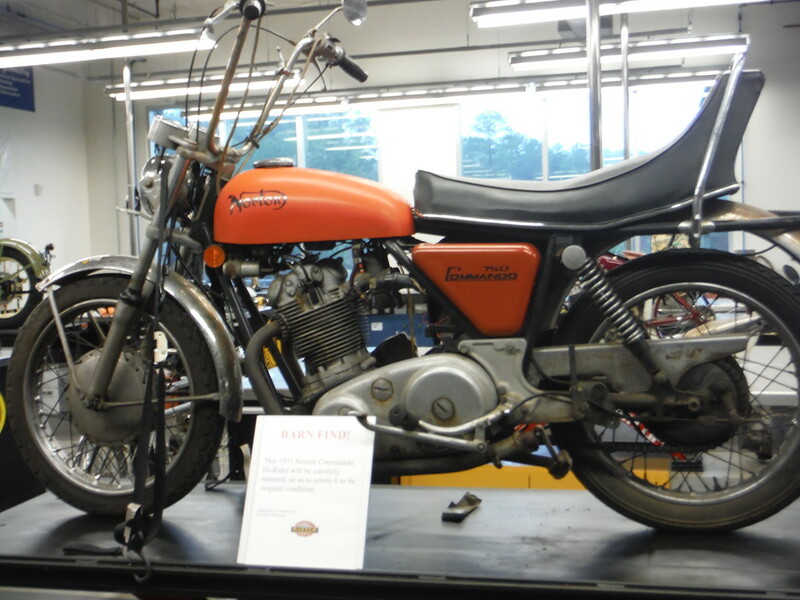 Hey Barbers, go find a bike that would warrant a restoration instead of wrecking that one and taking the easy option. It is in ORIGINAL condition and that is a rarity. IMHO Barber's Norton guy B Slark does not care about originality much.